I have yet another great author interview for you. 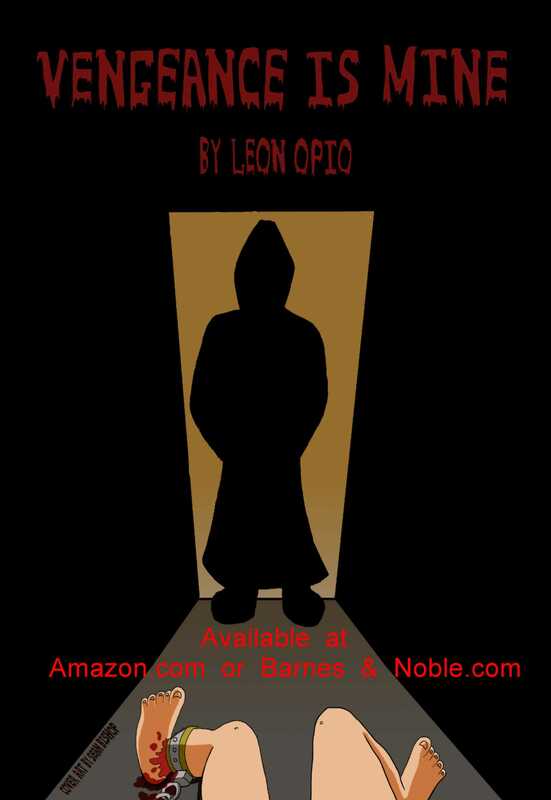 This time I had the opportunity to interview author of Vengeance is Mine, Leoncio Opio. Four people are being held captive in four separate rooms. They are each responsible for the same crime and will endure their own private hell. While in these rooms they will re-live the acts that have brought them together. They will each endure fear and pain, they will understand how it feels to yell for help and have no one come to their rescue. Even though the bible states, “Forgive us the wrongs that we have done, as we forgive the wrongs others have done to us,” the one I own is missing those pages. As the day goes by and the night sets in, I smile at the thought of the truth my guests will endure but by the end of their journey, they will all fully understand that Vengeance is mine. 1) Would you tell the readers a little bit about yourself? My name is Leon Opio; I’m married to a great woman named Tabitha and have two daughters Alexis 21 and Arlene 14. I’m originally from Brooklyn, NY and have been living in Delaware for the last 12 years. 2) Which project are you currently promoting? 3) Can you tell us what the book is about? The book is a suspense thriller dealing with the journey that four people will endure separately, but will have a lasting effect on all of them as a group forever. 4) How did you come up with the title for this book? I wanted everyone to understand that the main character deserved vengeance. 5) What inspired you to write this book? I love stories and movies that leave you always wanting more, stories that shock you when you least expect it. So I wanted to write something that I would have loved to read or see for myself. 6) Did you have the main character’s names already picked out before you began to write? 7) What can you tell us about your main characters? I can tell you that the more you learn about the characters you will definitely hate them, especially one particular character. 8) Did you have to do any research in order to help you with the writing of this book? No research just a fan of thriller, suspense and horror movies with a surprise thrown in. 9) What made you decide to become a writer? I have always wanted to be a writer, but have gotten discourage for one reason or another. But I have to say the encouragement of my wife got me writing again and I have to admit I now feel inspired to write all the time. 10) What genre do you generally write? 11) Are you interested in writing other genres? 12) Do you follow a routine when you begin to write a scene or chapter? No, I write as much as I feel I average normally an hour a night, usually after midnight when my mind is most relaxed. 13) How long does it usually take for you to write a book? I would say about three months unless I get stuck on something. 14) Do you have a general idea of what direction you want the plot to take ahead of time or does it come to you once you’ve started writing? The plot normally comes to me as I write. 15) What character out of your most recent work do you admire the most and why? The main character of Vengeance is mine, because through it all you can overcome. 16) Have you ever had second doubts about a story you’ve written? If so, have you wanted to rewrite some parts of it? The first book I wrote after I finished it, I was not happy with the final product so I’m currently working on ways to re-write many portions of it. 17) Are there any authors you admire? 18) What are your favorite titles from this or other authors? James Patterson Alex cross series are great, Stephen King the classic Carrie, Cujo and with Dean Koontz the Taking. 19) Have you written any series? If not, are you planning to write any in the future? No, Yes I do have a series that I have been toying with the idea since the first book is being reworked. 20) What other projects are you currently working on? 21) When you begin a new MS, does it start with an idea, concept, or both? It normally starts with both. 22) Once you begin to work on a new MS, do you have the ending already mapped out or do you envision it as the story progresses? Funny to admit I normally have the ending before the story has even started. 23) Are there any writing styles you prefer? 24) Did you self-publish? If not, is that something you will be willing to consider in the future? Yes I’m an Indie self-Published Author. 25) What is your least favorite part about getting published? 26) Was the road to publication a long one for you? 27) Do you use a pen name? If so, why? 28) Where do you see yourself in five years? I hope to have at least fifteen books published and at least one on the NYT list. You must always shoot for the moon, if you don’t make it you land among the stars. 29) What is the best advice you can give to a new author? Never give up, follow your dreams and write what you feel. My Name is Leon Opio, But my friends call me Leon. I was born in Brooklyn, New York, and lived the first 34 years of my life in the East New York section of Brooklyn. I currently live in Delaware with my wife Tabitha and our daughters Alexis and Arlene. My newest book “Vengeance is Mine” a thriller is currently available now. I will be following that up with a YA paranormal story titled “Second Chance” and a sequel to “Vengeance is Mine” coming out on Halloween 2013.